Thanks for your choice! We provide 24-hour email reply. you can feel free contact us. 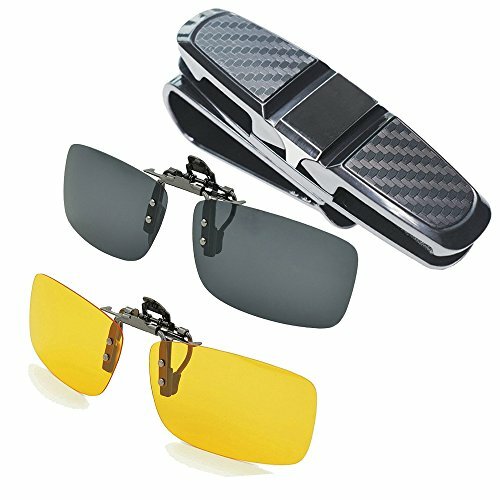 BLACK and YELLOW Clip-on Sunglasses, One Double-Ends Clip and 180¡ãRotational Car Glasses Holder. 1. Polarized lenses - which could improve your vision and sharpen your eyesight. 2. UV400 Lens Technology - Absorbing over 99%of harmful UVA&UVB spectrums. 3. Lightweight - No burden. 4. Impact Resistance - Not easily damaged. 5. Super toughness - Withstand 85¡ã bending. 6. Compatibility - Easy to clip on to most regular glasses. Car Glasses Clips: Both Ends of the Clip can safely place 2-pairs Polarized Glasses, 180¡ã Rotation Design makes your easy to adjust the glasses's position vertically. Friendly Service: Thanks for your choice! We provide 24-hour email reply. you can feel free contact us. If you have any questions about this product by Aioink, contact us by completing and submitting the form below. If you are looking for a specif part number, please include it with your message.